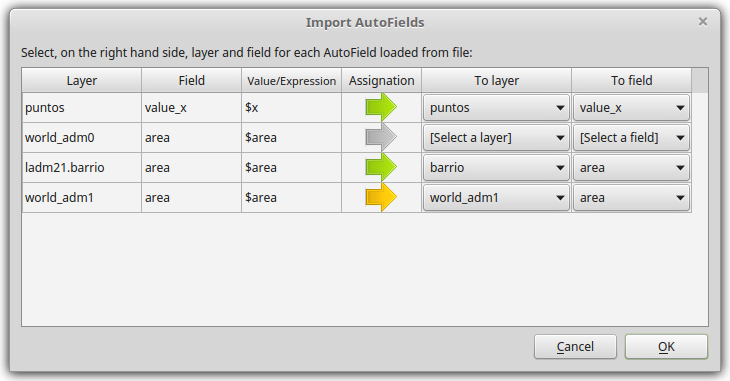 If you are new to AutoFields, read AutoFields plugin for QGIS first. Think about delivering AutoFields configurations along with your geographic data to your customers; think about sharing AutoFields with your colleagues; or perhaps just working on two environments and keeping your data and their configuration in sync. All of these scenarios are now possible with AutoFields v0.5.0. In this post I show you how. 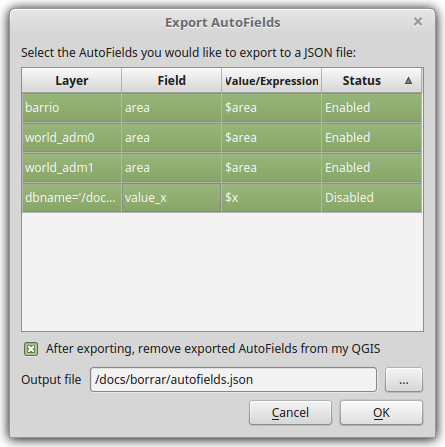 Select the AutoFields you would like to export, choose whether you want the exported AutoFields to be removed from QGIS, set the JSON file path, and click OK.
As you can see, all AutoFields from the JSON file are listed. 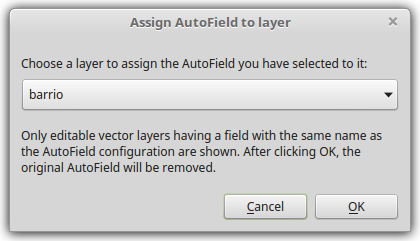 You can assign each AutoField to a layer (and field) already loaded in QGIS. To make the import process easier, the plugin attempts to match AutoFields with layers/fields for you. The AutoField will not be imported and will be ignored in the import process. The AutoField will be assigned, but overwriting an existing AutoField on the given layer/field. The AutoField will be assigned normally (without any problem). It will be impossible to do the import, because two or more AutoFields from the JSON file are being assigned to the same layer/field; in that case, you won't be able to proceed unless you change troublesome assignations. Finally, complementing export/import functionality, you can now select a disabled AutoField, right click on it, and assign it to another layer already loaded into QGIS. Sometimes you change the location of your layer (e.g., a Shapefile), which disables all AutoFields you had configured on it. Using this functionality, you can easily "transfer" those disabled AutoFields to their corresponding updated layer. Read 11573 times	| Like this? Tweet it to your followers! will auto fields work with QGIS3.0? have you seen that QGIS 3.x supports attribute updates when editing features? Check that out and let me know if that's not enough for you.